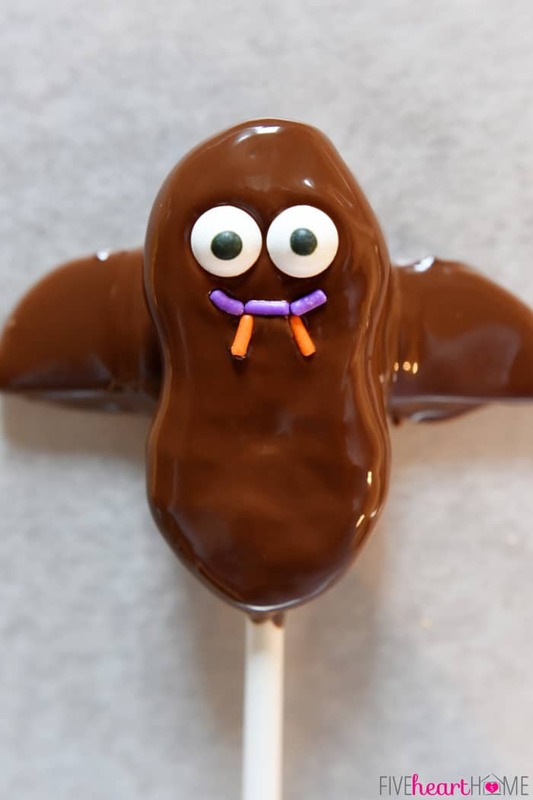 Halloween Cookie Pops start with Nutter Butters, Oreos, chocolate coating, candy eyes, and sprinkles to create adorable bats and mummies! I always enjoy creating cute, sweet, holiday-themed treats for and with my kid and last Christmas, I made some festive cupcake toppers using Nutter Butter sandwich cookies. They were such a hit that it got me brainstorming which Halloween characters I could bring to life using Nutter Butters. 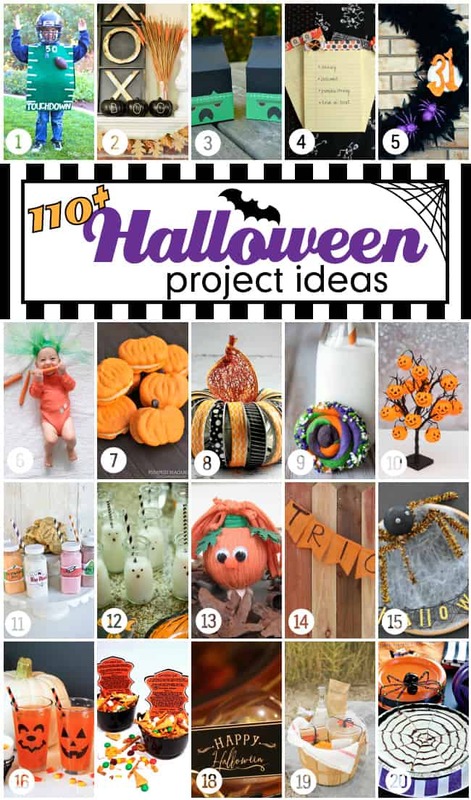 The first ideas that popped into my head were bats and mummies, and I have to say…I just love the way they turned out! 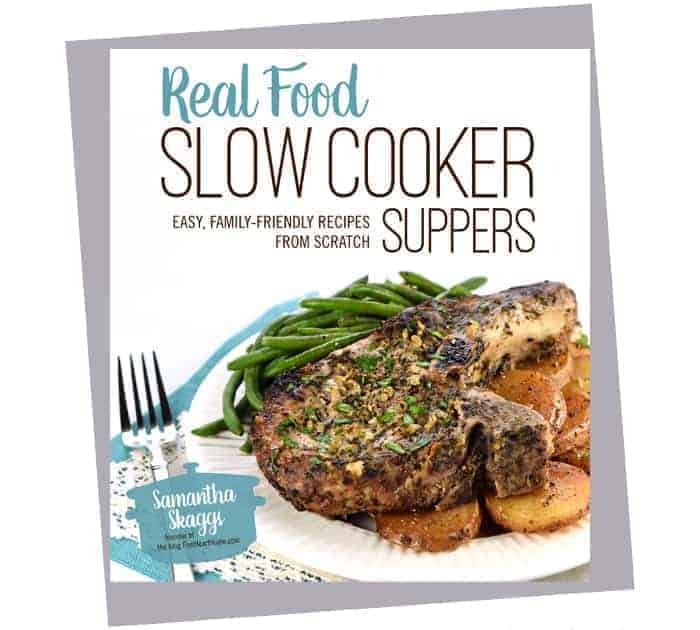 So I think the best way to illustrate this “recipe” is to walk y’all through some pictures of the process. 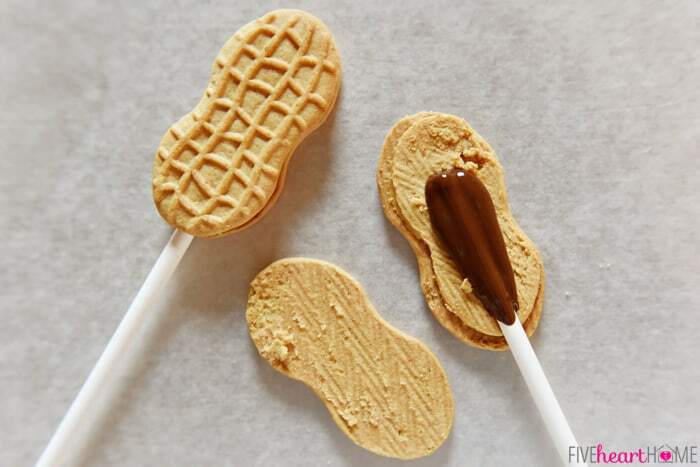 These cookie pops don’t require a recipe as much as a succession of steps! 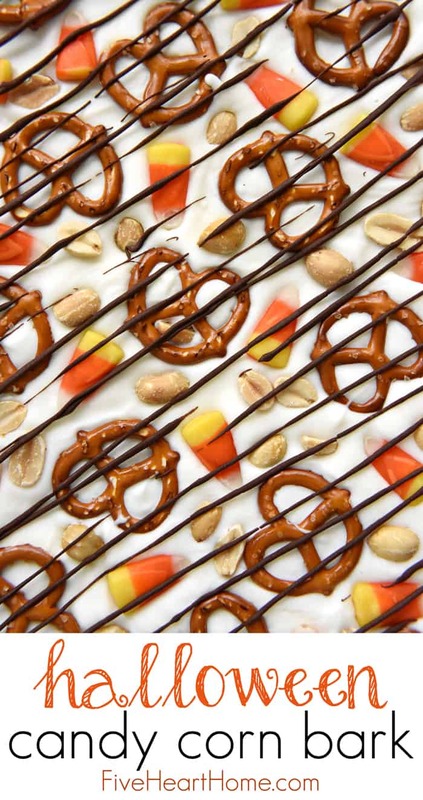 If you have candy coating or candy melts, that makes this recipe really easy. 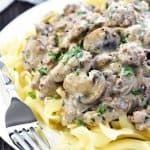 If you don’t, however, no worries…you can also use melted chocolate chips with a little bit of vegetable shortening stirred in, which helps the chocolate set and harden. 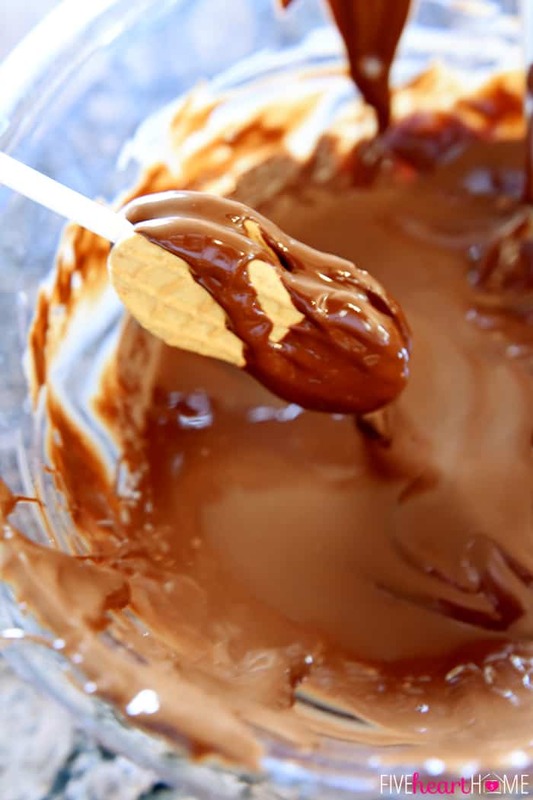 Once the chocolate was melted, I took apart the Nutter Butter cookies, pressed a lollipop or cookie pop stick in the center of the filling, and spread a bit of melted chocolate on top. Then I placed the top back on the cookie, made sure it was adhered to the melted chocolate, and let it rest for several minutes until completely hardened and set. Make sure you give it enough time…the last thing you want is for your cookie to fall off the stick when you’re trying to dip it! 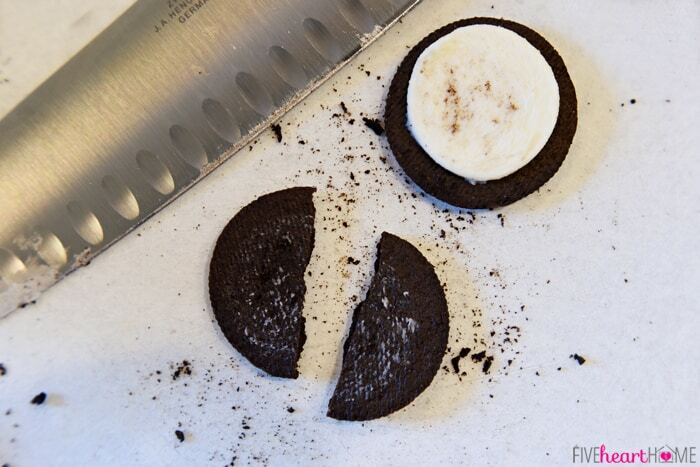 While the cookies are drying, take apart some Oreos (or your favorite round sandwich cookies), scrape off the filling (nobody has to be privy to how you inhale it dispose of it), and use a sharp knife to cut them in half. You may have some breakage, in which case you will have to take one for the team and eat the sad, imperfect pieces. So sorry…it’s a tough job, but somebody’s got to do it. 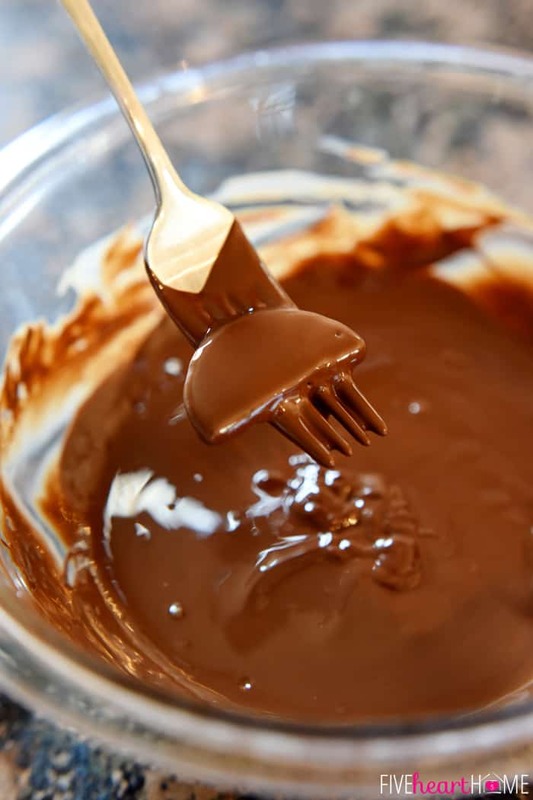 Take your Oreo halves and use a fork to dip them in the melted chocolate, allowing as much chocolate as possible to drain between the tines back into the bowl. Arrange your chocolate-dipped Oreo halves in pairs on a wax paper or parchment paper-lined baking sheet, so that the corners touch and the flat bottom edges are aligned. Take your dipped Nutter Butter (the bat’s body) and lay it on top of your dipped Oreo halves (the bat’s wings). I use a broken Oreo piece (assuming there are any left — ahem) to prop up the bottom of the stick so that the Nutter Butter can lay flush on the Oreos while the chocolate sets. 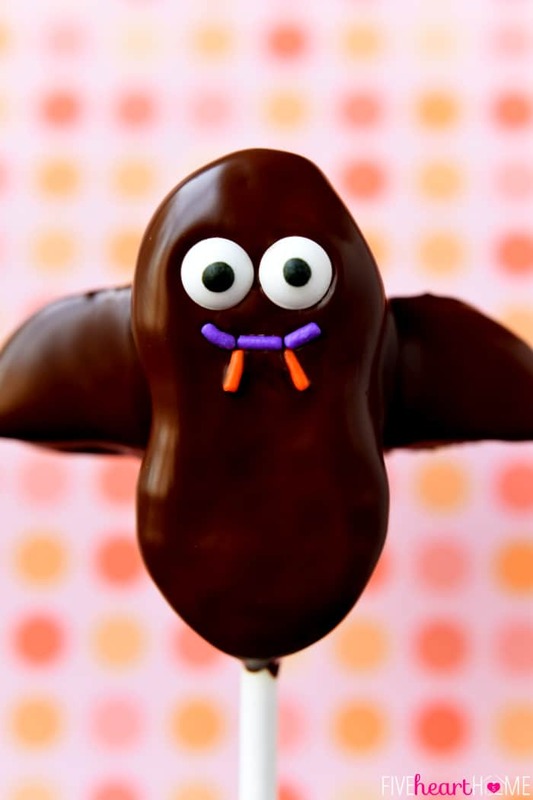 While the chocolate is still wet, place candy eyes on the bat’s face. 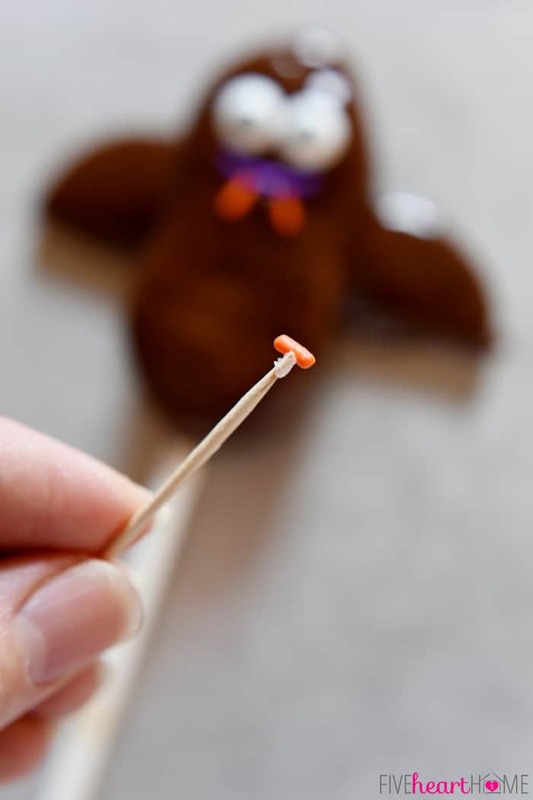 Then put a teensy bit of vegetable shortening on the tip of a toothpick and use it to pick up individual sprinkles. Once your bats are all assembled, give them a nice, long time to dry before you attempt to peel them off of the wax paper. While your bats are setting, melt your vanilla candy coating in another bowl. 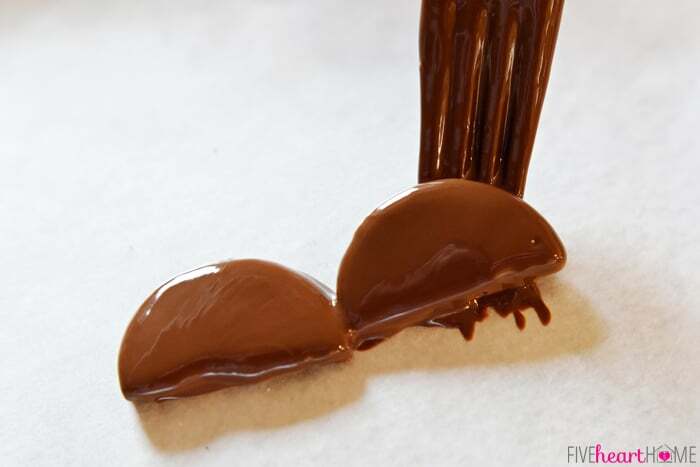 Follow the same steps for assembling your cookie pops, allow them to harden, and then dip your Nutter Butters in melted candy coating. 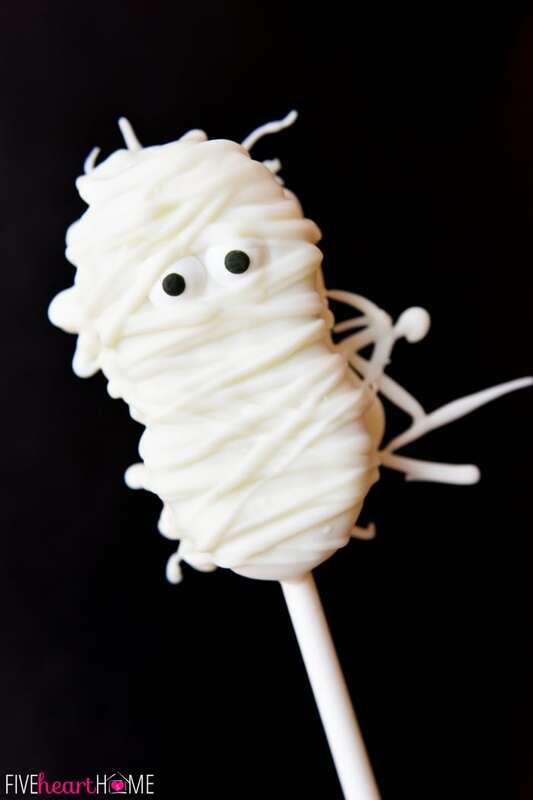 Once you’ve dipped as many mummy cookie pops as you wish to make, place the candy eyes. Then scrape the remaining vanilla candy coating into a plastic baggie. Twist up the top and cut a teensy hole in the corner of the bag. Drizzle lines back and forth all over your white-dipped Nutter Butters to resemble the bandages of a mummy. Be sure to leave a space for the eyes to peek out! 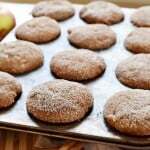 Allow the cookies to completely dry and harden. When you peel them off of the wax paper, there will likely be a bunch of vanilla candy “strings” extending from every side. And that’s it! Now you’re ready to enjoy a whole arsenal of Halloween Cookie Pops! Make as many as you wish. 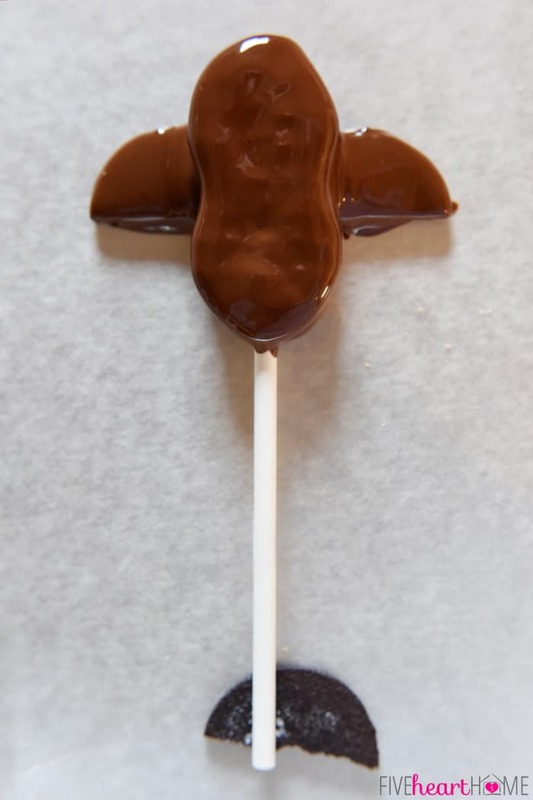 I found that I could make about 5 bats for every 1 cup of chocolate chips and 5 mummies for every 8 ounces of candy coating. Those are just estimates, but hopefully that will give you some idea of how much melted chocolate you’ll need depending on how many cookie pops you want to make! 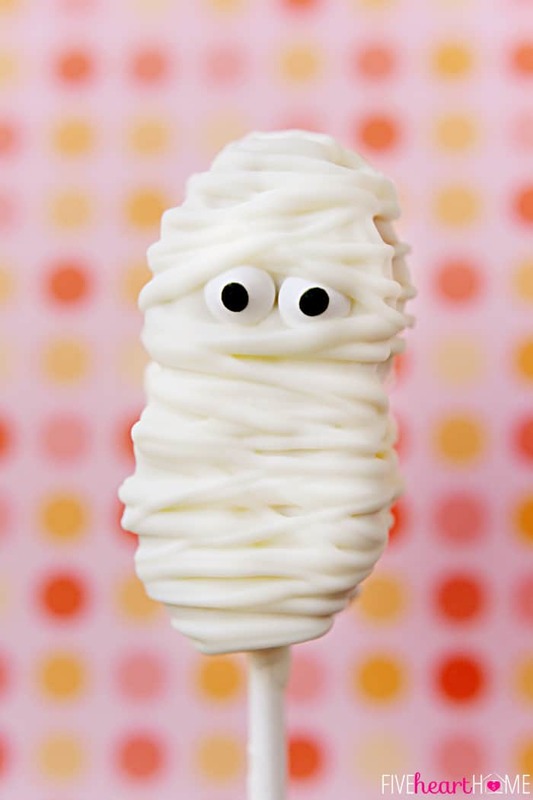 Make these Nutter Butter Bats and Mummies with your kiddos…or surprise you kiddos with them! 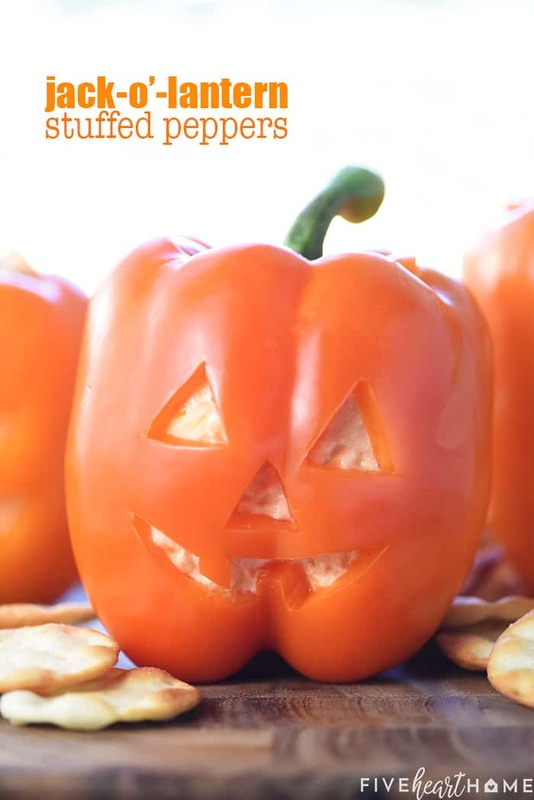 Serve them at a Halloween party. Wrap the cookie part in cellophane baggies, all lollipop-style, and share them as Halloween treats with classmates or friends. The possibilities are truly endless! Post originally published on October 10, 2014. But the awesome ideas don’t stop here! 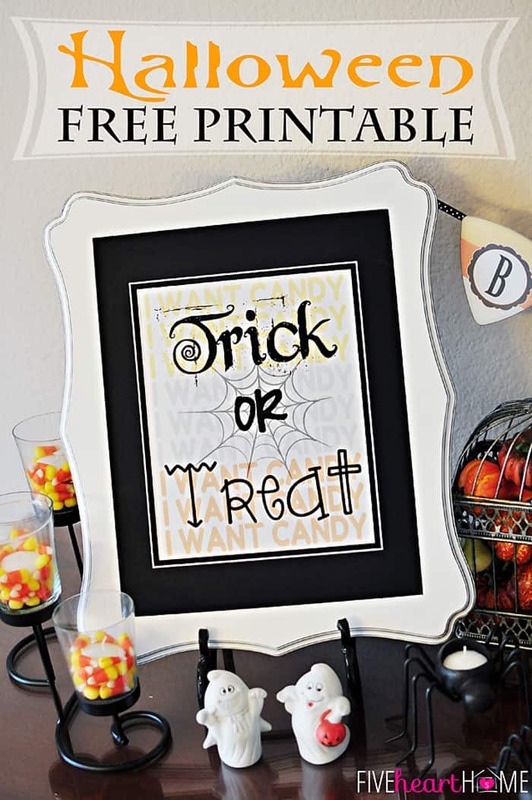 I’m so excited today to be participating in an awesome Halloween blog hop that’s been going on all week long. 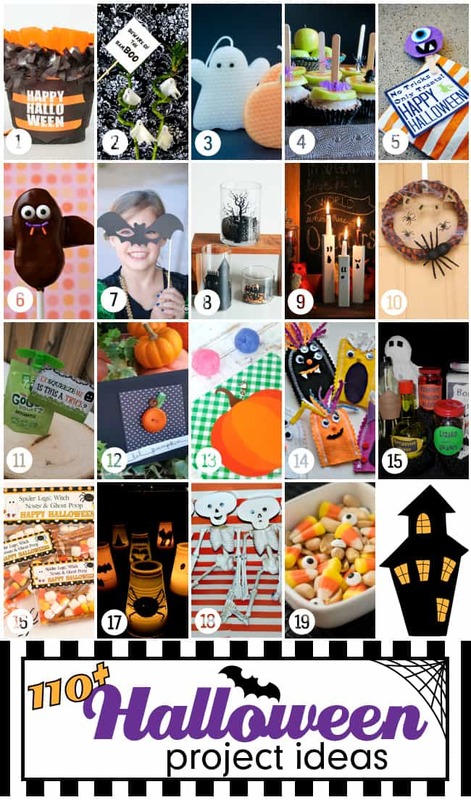 The fabulous Toni from Design Dazzle has gathered a bunch of talented bloggers, and together we’ve put together over 110 fun and creative Halloween ideas for y’all! 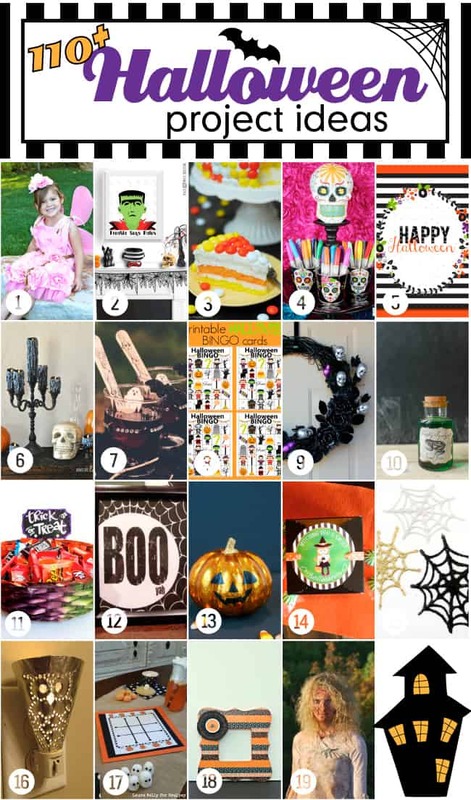 From costumes and parties, to crafts and home decor, to recipes and free printables…there’s Halloween inspiration here for everyone! 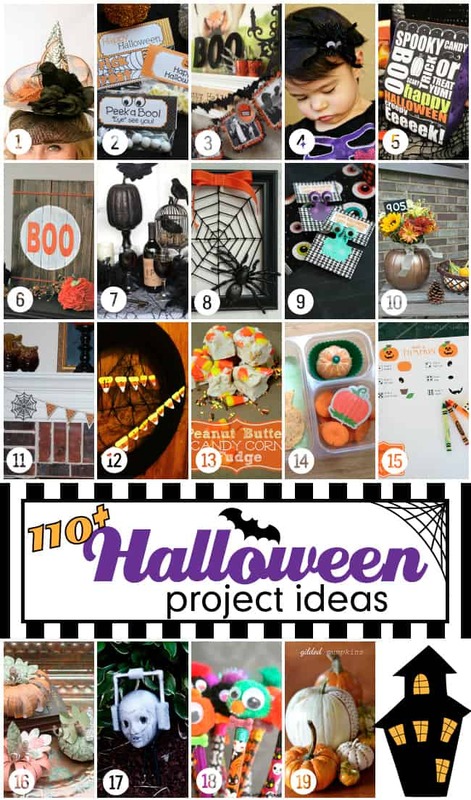 Check out more of the creative Halloween projects shared by my blogging friends for our blog hop by clicking on each of the links below! 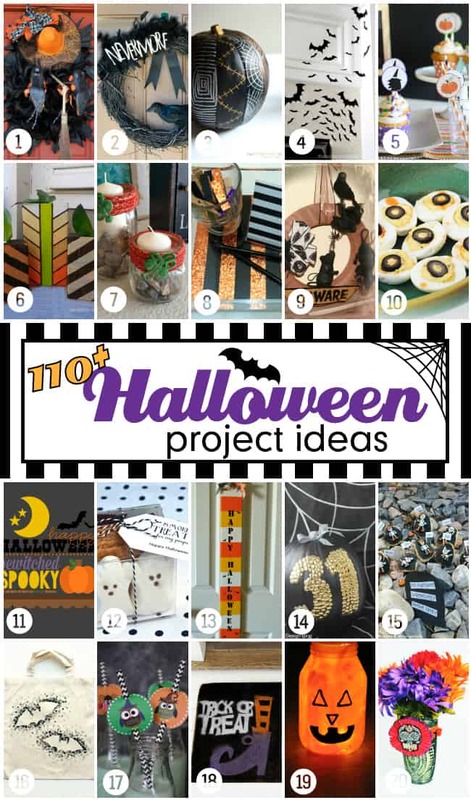 You’ll be taken straight to the Halloween project that you’d like to see in more detail, with additional information and photos on how to create it. Have fun and pin away! 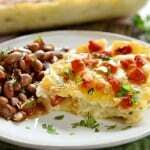 Pinterest board for even more inspiration! 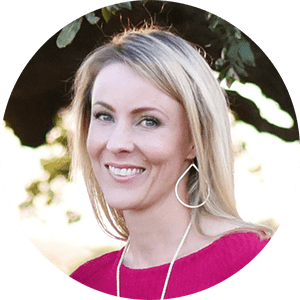 Visit the blogs of all 110+ bloggers participating and see what else they’ve been up to! 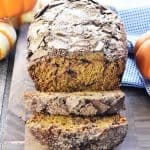 I do hope you will share your recipe with my Big Autumn Bash Link Party! Thanks so much, Mila…and I appreciate the invite to your link party! I just hopped over and linked up. 🙂 Hope you’re having a great week! 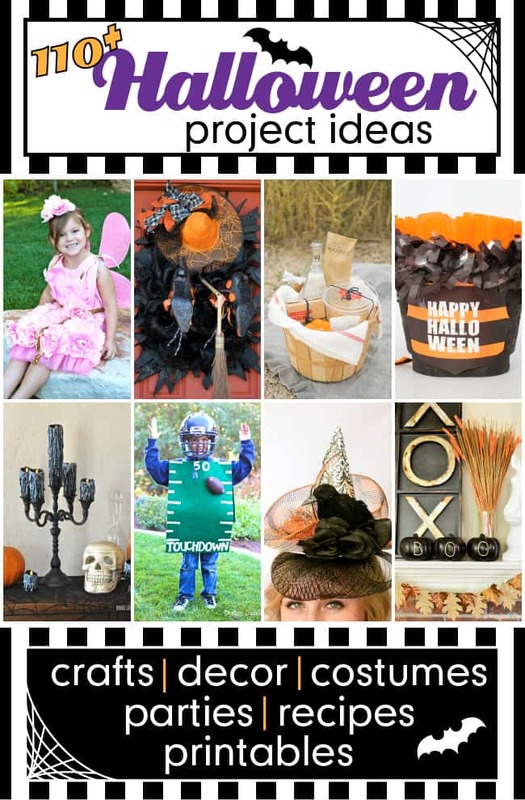 Wow….so many amazing and adorable project ideas! I LOVE this post! Thank you for sharing! Thank you, Michelle…you are too sweet! 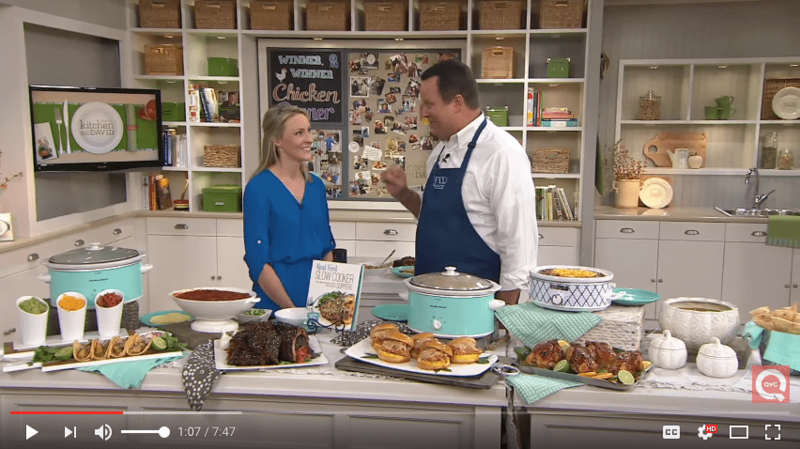 Thanks for stopping by and I hope you have a wonderful weekend! I really appreciate your kind words and the pin, Michelle! Happy Friday! Love all your ideas. 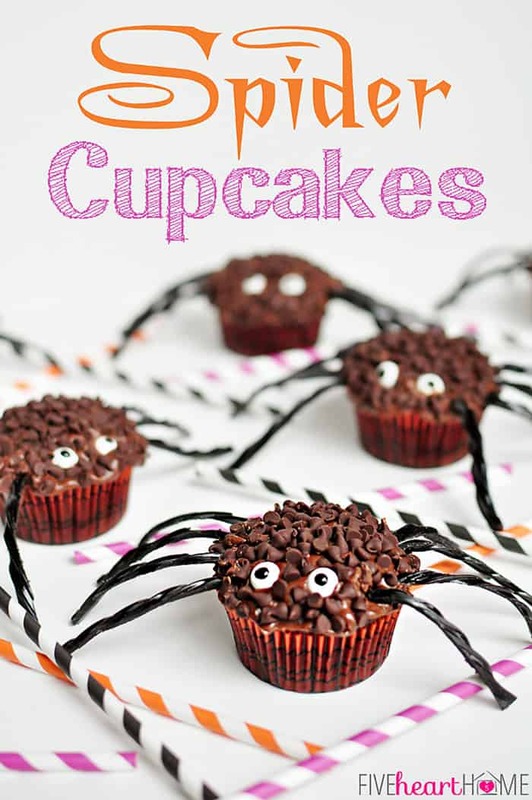 Can’t wait to make the bats and mummy’s for this weekend’s party. Tip I have : when working with melted candy coating I put it in my mini crock pot to keep it melted so I don’t have to continually put it in the microwave. Great tip, Marilyn…thanks for sharing that! 🙂 Have fun at your party!